I believe that being organised only serves to strengthen the professionalism and reputation of a referee. One of the items that lead to organisation is match cards. Some people have picked up the re-usable match cards that you can get from all sorts of referee stores now. I have a set from HeyRef.ca which I am reserving for a game I have to deal with in adverse weather conditions aka heavy rain. Refsworld.com no doubt have a fantastic collection of write-on match cards here. They also have their own YouTube demonstration to show how it works which is a reliable example! Refereeworld.com has one as well but I hope you know German if you are going to use those! The last source that I noticed recently, courtesy of ITOOTR.com, is WriteOnCards.com. 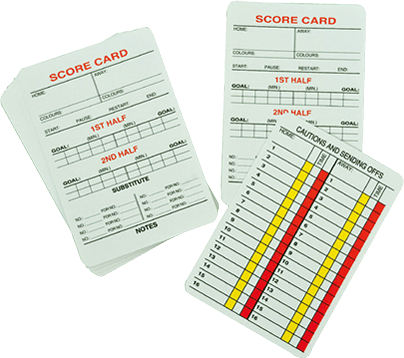 I’ve taken a quick browse through the website and the custom cards (including match cards) available for referees looks quite good. Have a look! 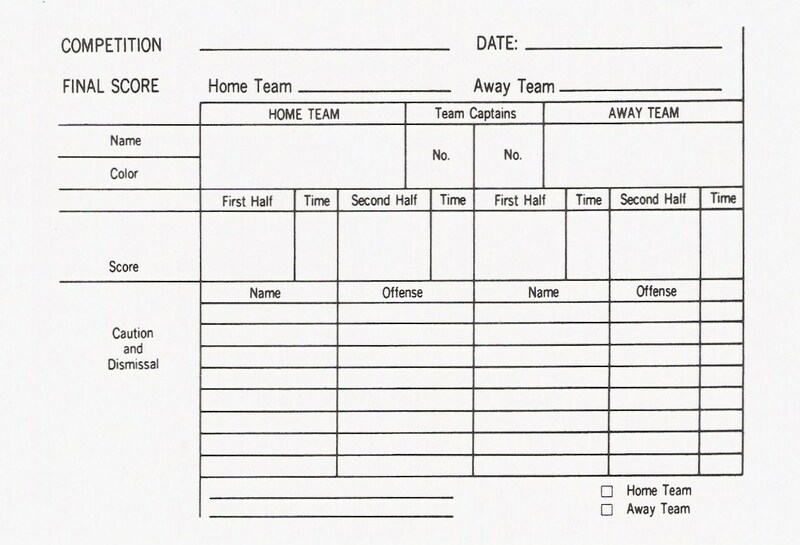 Some referees opt for a lined piece of paper upon which they write all their blank notes. You would definitely need a thick piece of paper to withstand typical weather conditions and to stick to the wallet. With regards to the most commonly used method, paper printed match cards, the majority of my discussion lies here. When you started out in the grass roots, you might have received a template match card with the wallet you bought or from a mentor. From there you might have kept a copy and continued to photocopy or ran out of them and reverted to method 2 (blank pieces of paper). A technique I use that I would like to share is that I design my own match cards. Why not have a match card that works exactly how I want it to and is user-friendly for me! I design them in pairs (two on a page) so that when I get a new set, I try them out and continue tweaking until I find a match card version that is just perfect for use. Typically the fifth or sixth draft. Microsoft Word is the easiest way to do it! I would like to share some of the match cards I use. Perhaps they could help you or inspire you to create your own! I’ve included editable document files wherever I could if you would like to modify it for your use. If you would like to share an editable version or scan of your own unique match cards, feel free to shoot me a message or comment below. Post a comment if this was helpful! This entry was posted in Useful/Fun Know-Hows and tagged futsal, game card, match card, organisation, outdoor, report form, solo. I like the format in Outdoor 2. Thanks to TheTopRef for the link.